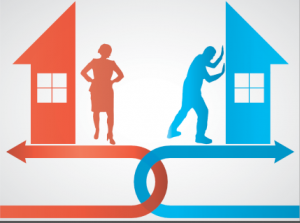 If a married couple has accumulated assets, liabilities/debt, or both during their marriage, these assets and liabilities will have to be divided between the divorcing spouses as part of the divorce process. Under Florida law, this property division must be equitable, with a legal presumption that assets and liabilities should be divided equally between the parties. An unequal division is possible, but only under factual circumstances that convince the divorce court that the unequal division is equitable under the particular facts of the case. Assets and liabilities are classified as either marital, meaning acquired since the marriage, or non-marital because they were acquired prior to the marriage. All assets/liabilities acquired since the marriage are considered to be marital unless a party can prove otherwise. The cut-off date for determining assets and liabilities to be classified as marital assets and liabilities is the earliest of the dates the parties entered into a valid separation agreement, another date expressly established by such agreement, or the date of the filing of a petition for dissolution of marriage. The date for determining the value of assets and the amount of liabilities identified or classified as marital may be a completely different date(s). The valuation date is determined by the divorce court and can be different from the dates for different assets/liabilities. The divorce judge will decide the valuation date(s) based on what the judge believes is just and equitable under the circumstances. For example, stock holdings might be valued on the date of trial, while a retirement plan might be valued on the date of separation or date of filing for the divorce. A favorable determination of the valuation date of marital properties can be a critical part of your Florida divorce. Consultation with an experienced family law attorney is appropriate to ensure that your divorce property division is, in fact, an equitable distribution.